With saturation steam as the primary fluid the primary temperature can be taken as a constant since the heat is transferred as a result of a change of phase only. The temperature profile in the primary fluid is not dependent on the direction of flow. 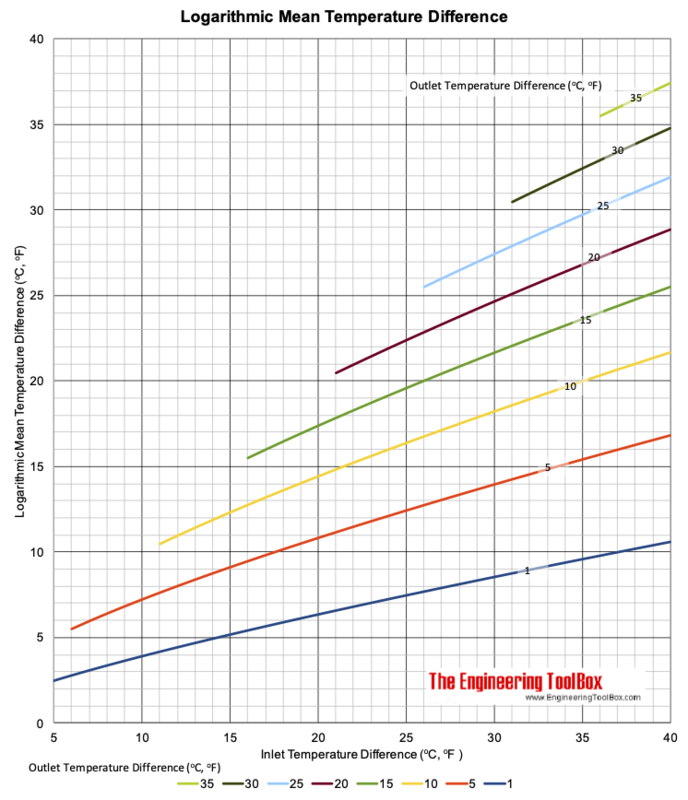 The Logarithmic Mean Temperature Difference is always less than the Arithmetic Mean Temperature Difference. A linear increase in the secondary fluid temperature makes it more easy to do manual calculations. AMTD will in general give a satisfactory approximation for the mean temperature difference when the smallest of the inlet or outlet temperature differences is more than half the greatest of the inlet or outlet temperature differences. The calculator below can be used to calculate Arithmetic and Logarithmic Mean Temperature Difference of counter-flow an parallel-flow heat exchangers. Hot water at 80 oC heats air from from a temperature of 0 oC to 20 oC in a parallel flow heat exchanger. The water leaves the heat exchanger at 60 oC. Steam at 2 bar gauge heats water from 20 oC to 50 oC. The saturation temperature of steam at 2 bar gauge is 134 oC. Note! that steam condenses at a constant temperature. The temperature on the heat exchangers surface on the steam side is constant and determined by the steam pressure.